Picking up where I left off last time, Chris and I had decided to have a meetup midway between us (I was south of Barstow, CA and he was at Alamo Lake, east of Parker, AZ.) 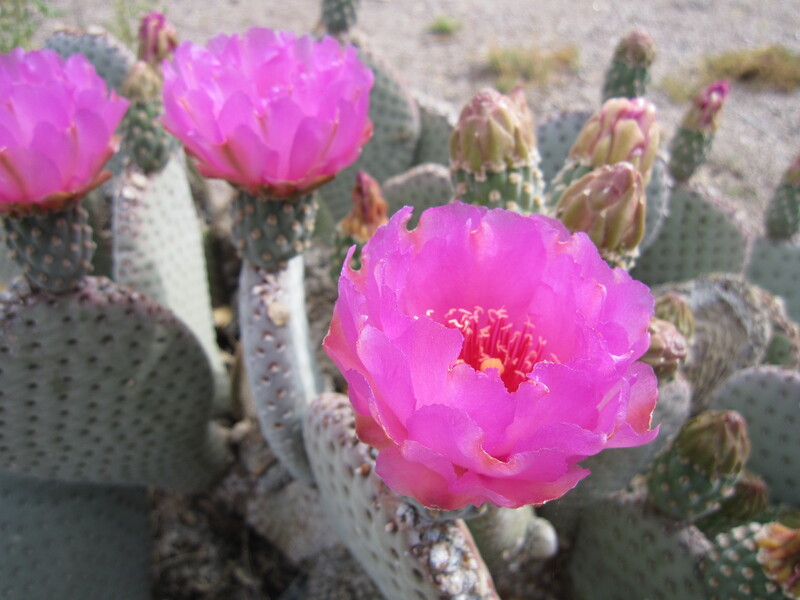 We decided on Goffs, near the Mohave National Preserve. 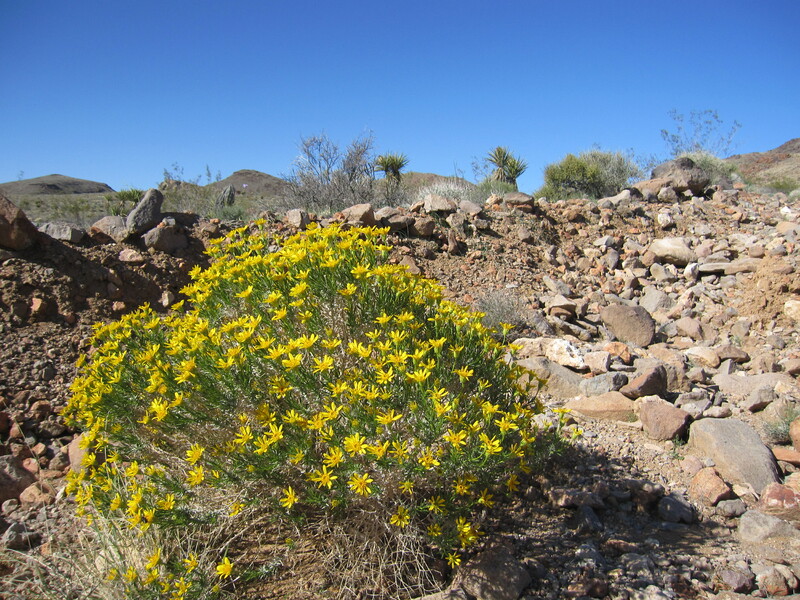 I figured we would be able to find a site to camp at, since there are BLM wilderness areas nearby, Mohave allows ‘roadside camping’, and they have a couple of traditional campgrounds. 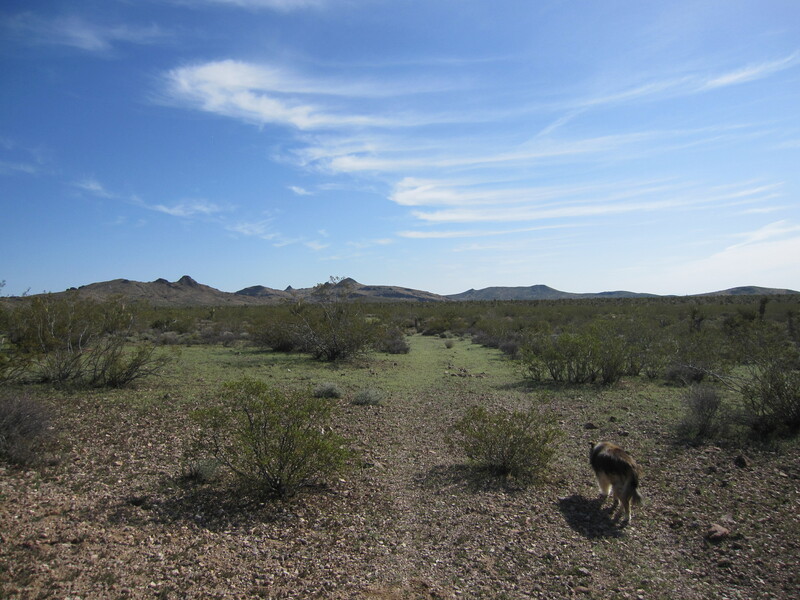 So, on Tuesday 3/19 Riley and I headed off through Barstow, where we dumped tanks and did some grocery shopping. 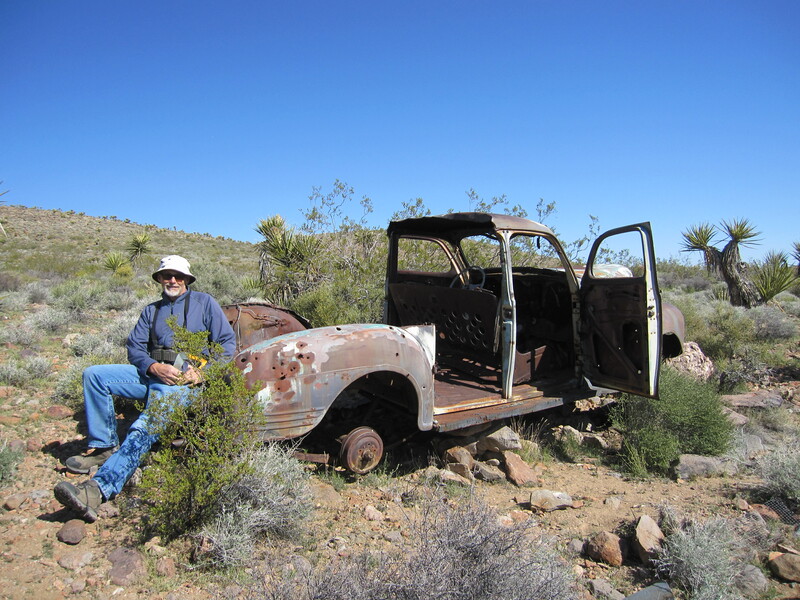 When we got to Goffs and met up with Chris we headed up Lanfair Road, one of the lesser used roads in the Mohave Preserve. Most of the visitor stuff is in the middle, off Essex Rd. 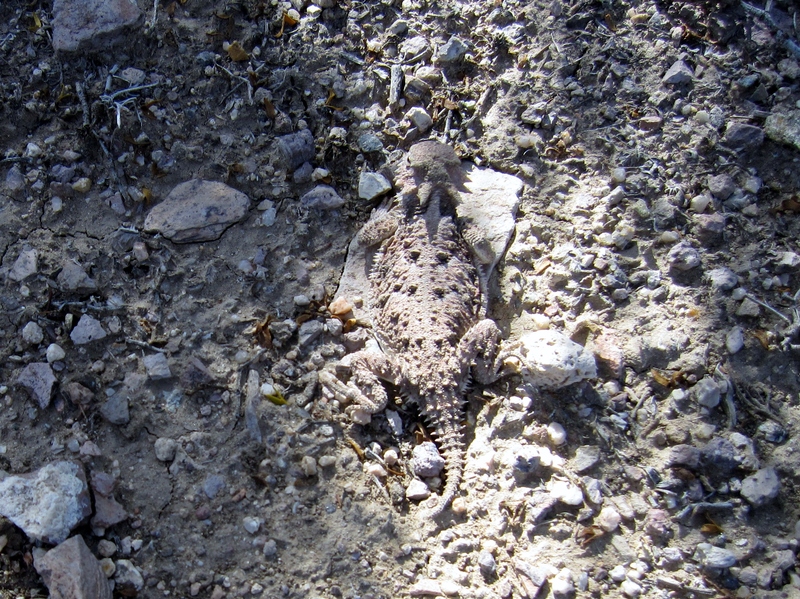 We found an old mining road, where there are a few sites that have been used for camping previously. We set up there and had a fantastic location – perfect climate at about 3000 elevation, not much road noise due to few autos traveling on that road, and great hiking among the network of old mining roads. Each morning we would head out for a hike. There were so many roads branching off and hills to climb. We always had someplace we wanted to visit the next day. 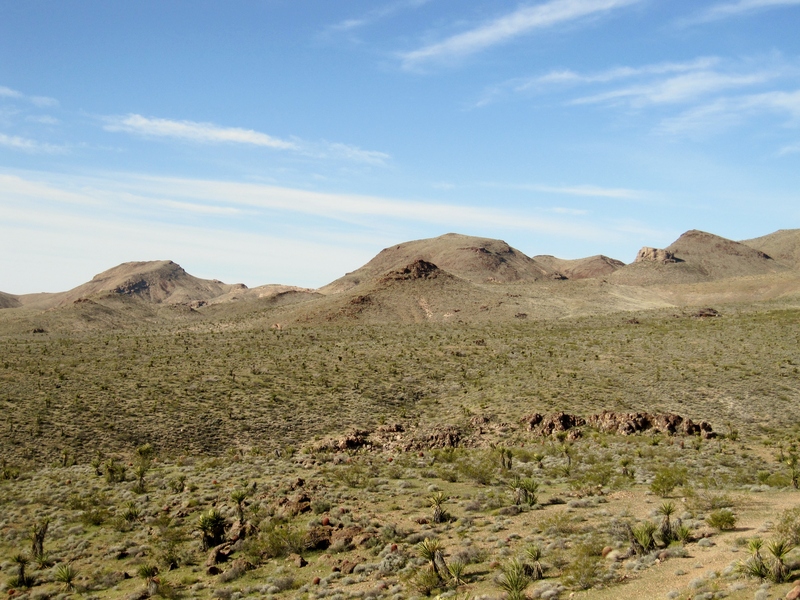 One day we hiked up to a high rock outcropping and could see some type of structure off in the distance. We decided to hike there the next day. 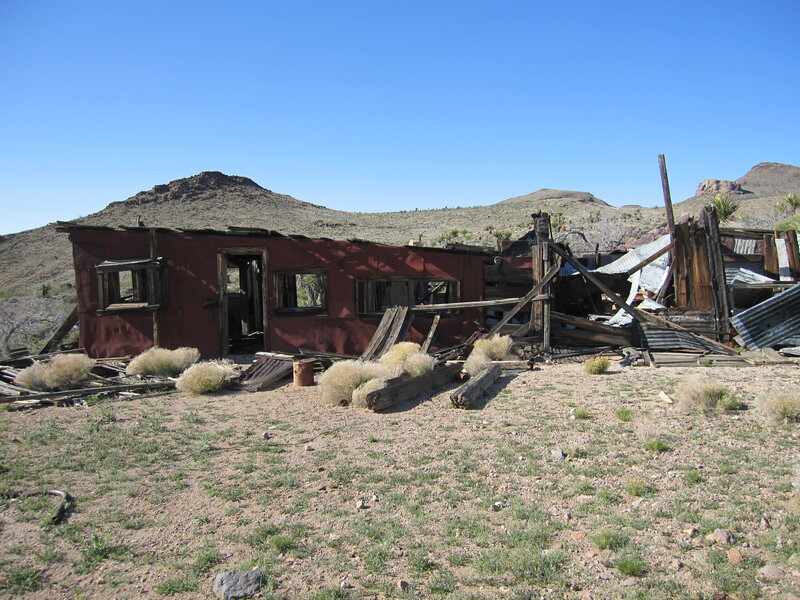 It turned out to be an old homestead. There was a crumbling wooden house structure and a foundation from a separate building. Like a mini ghost town. Also, there was a car. We call it the ghost car. 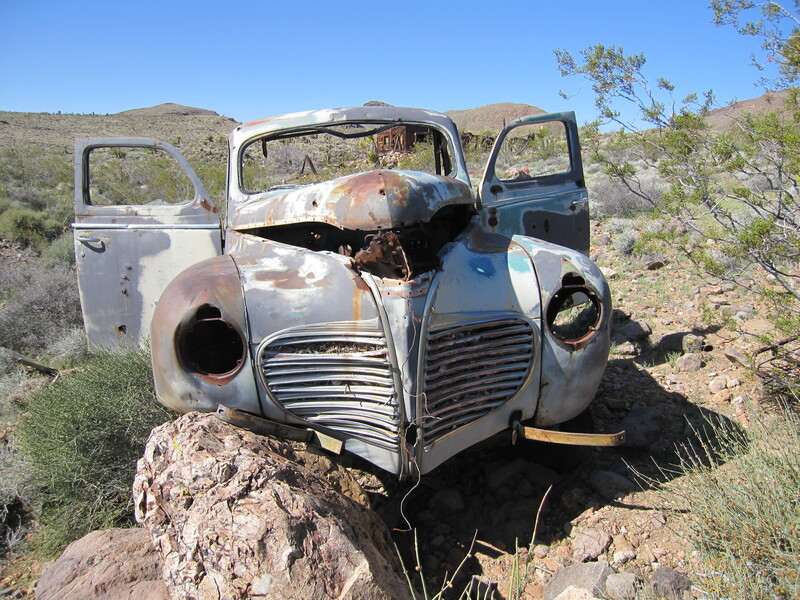 It looked like a truck, but on closer inspection it was originally a sedan. They had cut the roof off over the back to make a truck out of it. 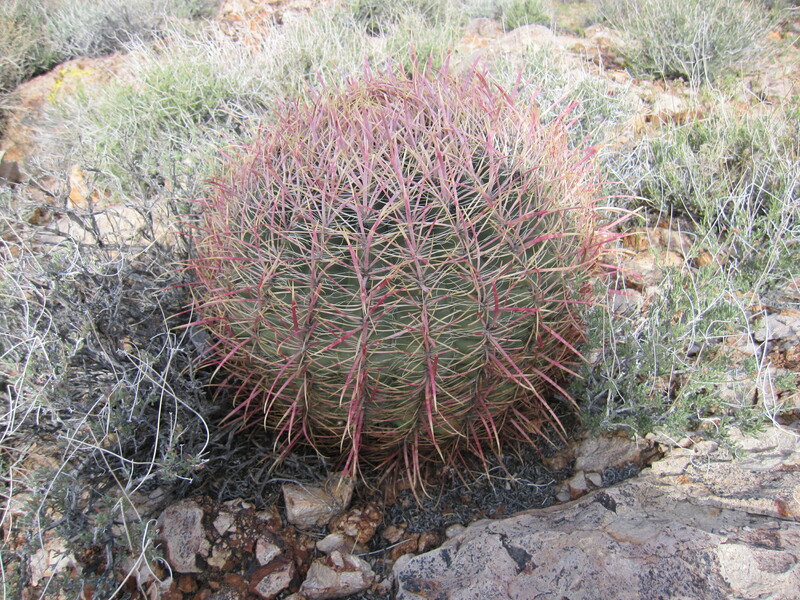 Anyway, we had a good time in the desert – visiting, hiking, cooking, just hanging. 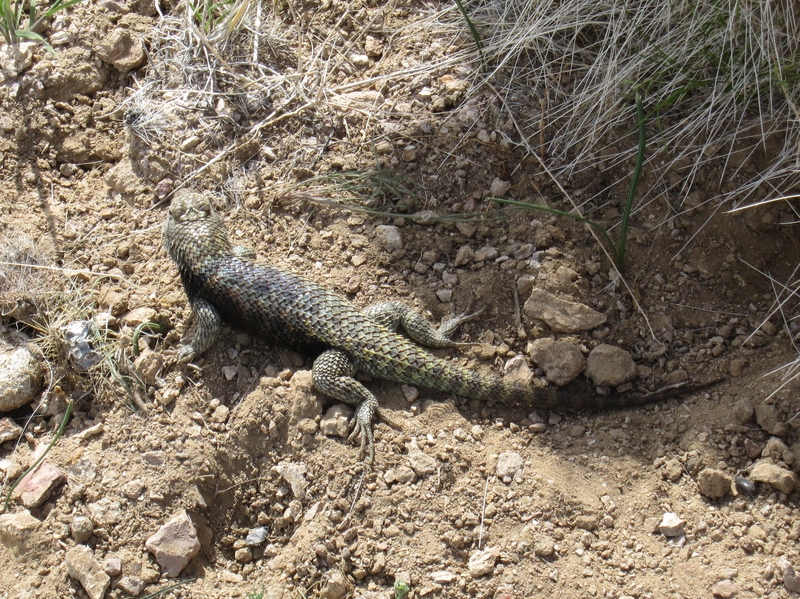 We didn’t see much in the way of wildlife, just some bunnies, a few birds and a couple of impressive lizards. We heard coyotes, but never saw them. 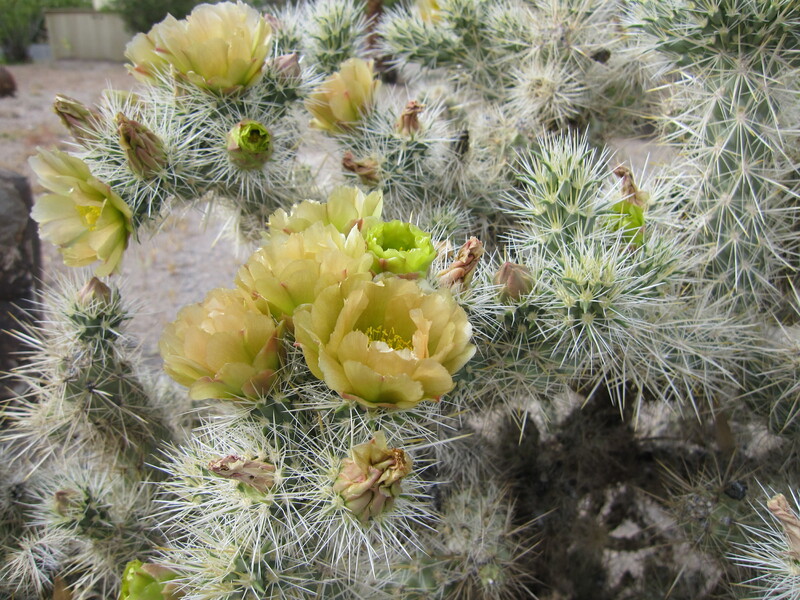 Lots of desert plants blooming in March. Old mining roads make good trails. Vegetation is slowly overtaking, but you can still make out the path. At about this time my folks were on a road trip to Las Vegas and I thought maybe we could meet up somewhere and have a visit on their way back home since I was so close. I emailed the suggestion and they arranged to stop in Laughlin, NV for a couple of days, March 27-28. 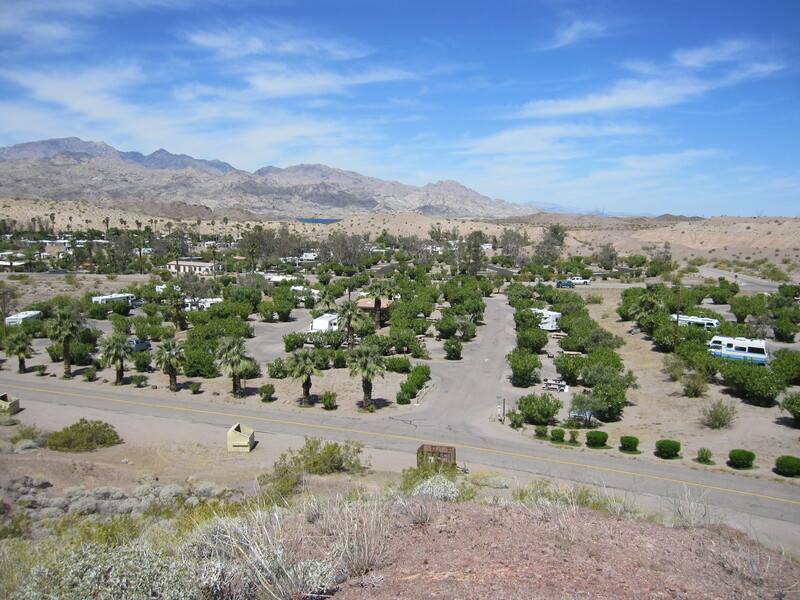 They got reservations at the Riverside Casino which has an RV park, so I got a site there. Chris and I headed over on the 27th. 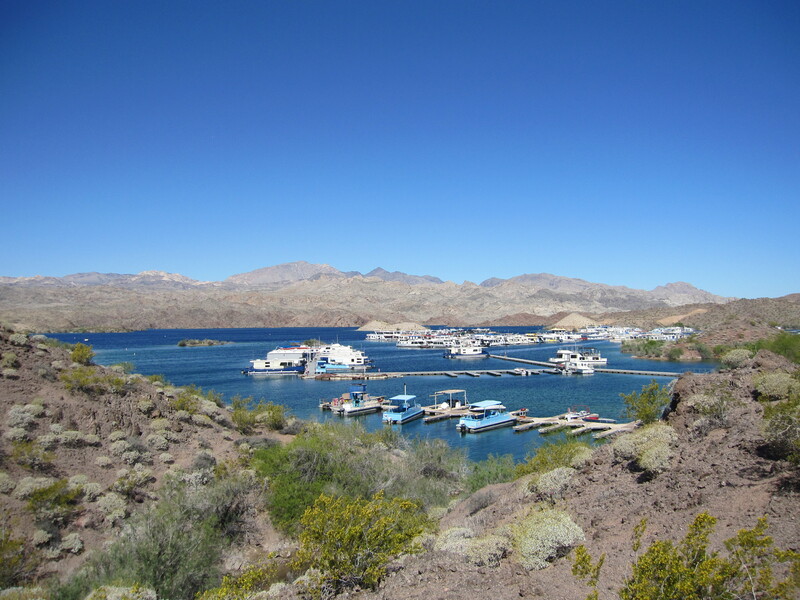 He was going to get a site at Katherine Landing at the southern end of the Lake Mead National Recreation Area, on Lake Mohave. Also, he has family in nearby Bullhead City, so would be able to work in a visit or two while there. I met up with my folks on Wednesday just after pulling into the RV park. It was so, so good to see them. We got to visit a bit, then we got them checked into their room. They were going to check out the casino and see how was the video poker. I headed back to check on Riley and finish getting myself settled. When I got back to the casino my mom had already hit a Royal Flush and won $1000. Yay! Then she forced me to take $100 to gamble with. I hung with them at the bar and enjoyed playing the poker machines. They had to remind me how to play at first. Once I got the hang I did OK, only going through $40 over the 2 evenings. We enjoyed dinners at the casino cafe, and Chris joined us for breakfast on Thursday morning. I can’t believe I never thought to have one of the waitstaff take a picture of us for the blog. Darn!! On Friday they headed back to Texas and I moved over to Katherine Landing where Chris was set up. He was fishing on the lake with his kayak. There are a lot of power boats on the lake. It has a marina and gets very busy. Not great for fishing, unfortunately. Katherine Landing Campground. Large Oleanders between sites provide some separation, but not much shade. 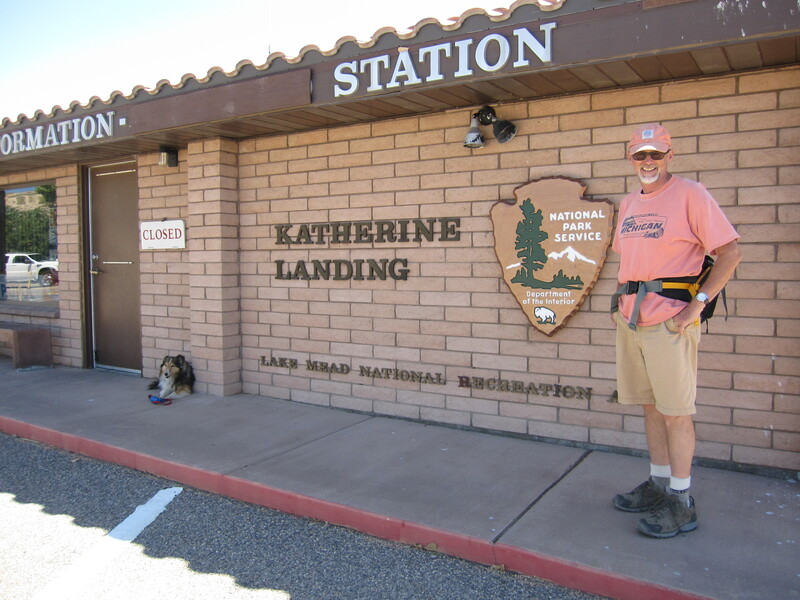 I had originally planned to stay a day or 2 at Katherine Landing before heading back to CA. But, I ended up staying longer to hang with Chris. Probably would have stayed even longer, but it got unbearably hot, up to about 90. Without hookups and no AC, it was really uncomfortable. 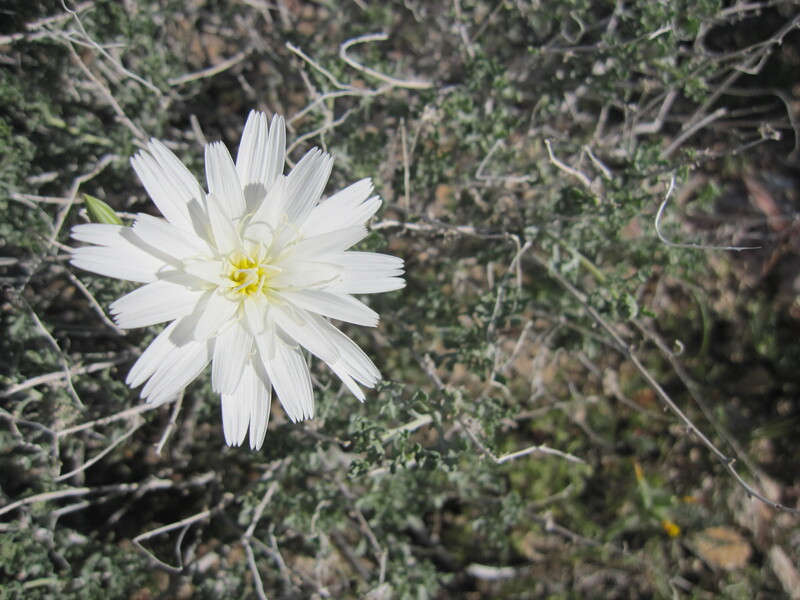 We drove around the surrounding BLM land looking for a place with higher elevation but couldn’t find anything suitable. So, we headed out on Thursday, April 4th. 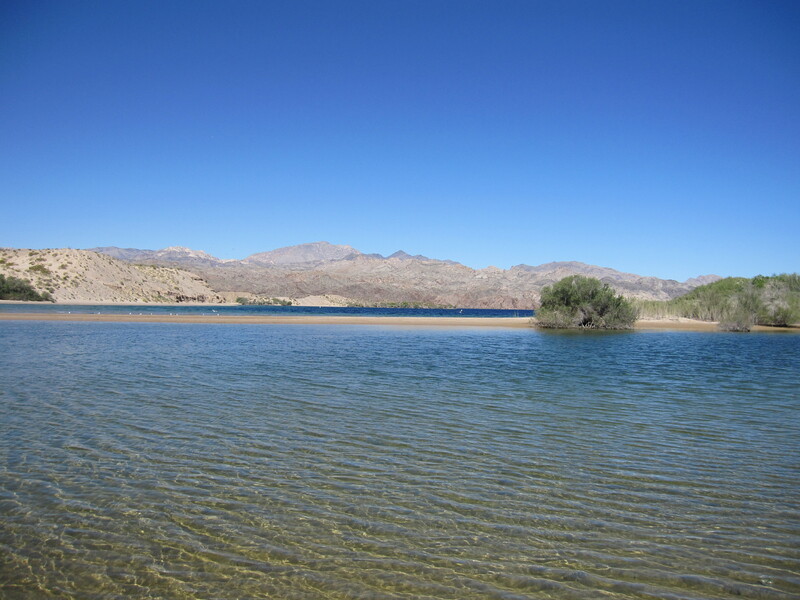 Chris was going to make his way to Prescott, AZ and his sister’s place, and I headed to Lake Isabella, CA. It’s at at the southern tip of the Sequoia National Forest and about 3000 feet elevation, so much cooler. That’s next…. 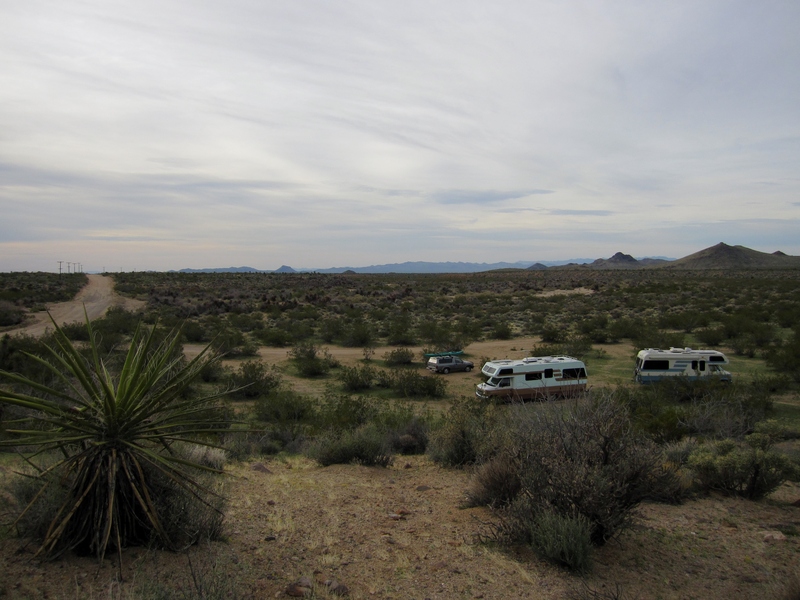 This entry was posted in Arizona, Boondocking, California, National Park Campgrounds by ontheroadwithriley. Bookmark the permalink. Wonderful adventures Jeanne!! I love the ghost car and well, all your pictures. Glad you find a great buddy to hang and hike with. I am almost back to Vermont, just stopping to visit friends in PA for a few days. Hey Chris! Glad you are having a good trip back to VT. Yes, so good to find a special person to travel with. He’s really great! Great catching up with you and Riley! Thanks Kim! I enjoyed reading about your visit with the gals in FL. I am enjoying your posts, especially the pics. Have fun in CA. Thanks Jim! Working now on planning visits to Yosemite, San Francisco and points between. Looking forward to reading about your big trip next month!